William Cavendish, Earl (later Duke) of Newcastle, of Welbeck Abbey, Nottinghamshire and Bolsover Castle, Derbyshire, was one of the largest English landowners of his day. In 1629 he appointed the surveyor William Senior to map his extensive estates in seven counties. Over the previous twenty years Senior had undertaken a similar survey for Newcastle’s Cavendish cousins - the 1st and 2nd Earls of Devonshire - of Hardwick and Chatsworth in Derbyshire. For both branches of the family Senior produced outstanding examples of vividly coloured maps bound into folio ‘atlases’. The Welbeck Atlas contains maps surveyed between 1629 and 1640 for Newcastle’s properties in Nottinghamshire (19 maps), Derbyshire (27), Staffordshire (9), Northumberland (20),Gloucestershire (3) and Somerset (3). Together these cover over 106,000 acres of land and provide an important primary source for local historians and archaeologists of the counties involved as well as for genealogists and cartographic historians. This ground-breaking Record Series edition incorporates two elements. Firstly this book contains a detailed Map Catalogue listing the names of all villages, fields and commons recorded on each map as well as the names of their tenants. This is prefaced by a scholarly introduction by the editor, Stephanos Mastoris, illustrated by over sixty colour plates of details from the maps. 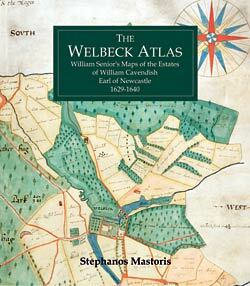 Screenshot of the Interactive Welbeck Atlas. 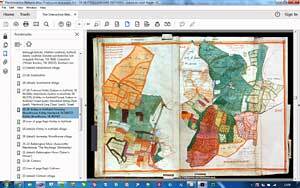 Secondly, a digital set of full colour reproductions of the maps is provided on an interactive USB flashcard at the end of the volume. All images are capable of being enlarged on screen to any desired scale. Please see the Ordering Thoroton Society publications page for information on purchasing Record Series volumes.